We are a leading Manufacturer of vertical chemical storage cabinet and filing cabinet from Coimbatore, India. We are the Leading Manufacturer,Supplier and Exporter of Vertical Chemical Storage Cabinet in Coimbatore, India. Available with our organization is a wide range of top-notch quality Lab Storage Cupboards for the customers. 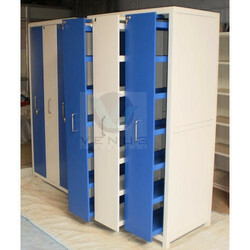 Provided with lockers, these cupboards are available in powder as well as spray painted structures. Our clients widely use these cupboards for storing powder form chemical in an efficient manner.